Harbor Deli next to the marina store is a full service deli. Meats, Cheeses, Salads, by the pound. Daily home made specials and the best Reuben in town! Open 5am-4pm To start your day join us for fresh made breakfast sandwiches and piping hot coffee. Lunch offers a variety of homemade salads,sandwiches and wraps. Our dockside seating is the perfect place to watch the boats return with their catches of the day or just enjoy the view with a cold beverage. Remodeled spring 2008, now has a closed in porch with heat and A/C for more comfort year round. For your convenience bag lunches can be preordered the day before your fishing trip for early pick up. 252-986-2500. Don't forget the fried chicken for your captain! Dinky’s Waterfront Restaurant opened in March of 2005. Throughout the restaurant you will see exceptional woodwork on the bar, wine rack, shelves and tables done in African Mahogany. The second floor restaurant has a panoramic view of the sound and is noted for the beautiful sunset views. We have an elevator for those who need it. For the most part we are open year-round at 5 pm seven days a week for dinner. During the winter months you should call as we may close a few days a week or for a short period of time. 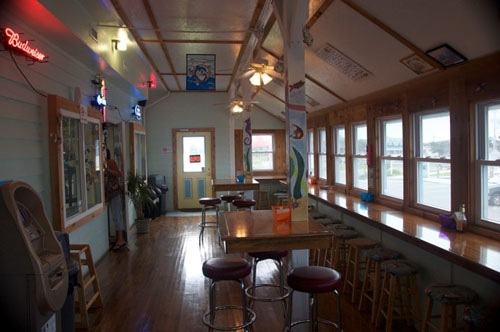 We serve fresh North Carolina seafood and Chef Dwight Callahan cooks up seafood specials nightly. Pasta dishes, duck, steak and lamb are also served. See the complete menu on this website. Menu changes each season. Friday night is Prime Rib Night and during the fall and winter, Monday night is Sushi Night. Our menu includes a wide variety of beers, wine and mixed drinks. You may contact us at 252-986-2020.